Pack size: 3 x 100ml DSW, 3 x 20ml Cleaner & 1 Contact lens case. 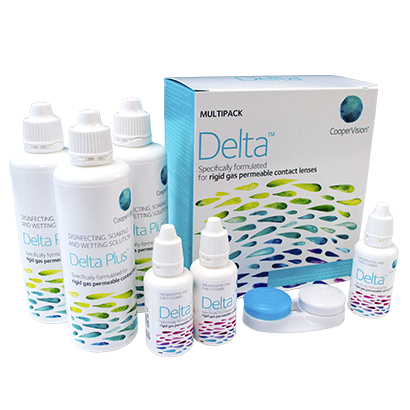 Review Delta Multipack The only fluids that do not irritate my eyes! Review Delta Multipack Lovely product , i am surprised at just how long it lasts ! It cleans brilliantly and my contacts stay comfy. Review Delta Multipack Lenses are comfortable after use, although I find that sometimes the cleaner doesn´t remove deposits completely. Delta Multipack Excellent quality, good value for money and lasts really long. Delta Multipack This set is awesome! Easy to use and my lenses are squeaky clean afterwards. Sauflon Delta Multipack contains all the cleaning and disinfecting products you need to keep rigid gas permeable lenses completely free from any dirt or bacteria that can build up throughout the day. This handy all in one solution will even provide added moisture to your lens, ensuring you stay comfortable for as long as you're wearing them. The multipack comes in two sections. Firstly, the Delta pack includes the Daily Cleaner. This is an easy to use way to start the cleaning process by removing any unwanted build up from the contact lens without risking any damage in the process. Secondly, the pack includes the DSW Solution. Lenses are immersed in DSW overnight, which contains polyhexanide - a superbly effective disinfectant which will leave lenses feeling like new in the morning. The Delta multipack contains enough solution to last up to three months at normal usage. The easy to follow two-step process is also safe and effective. If you rely on your RGP lenses, make sure they stay clean and comfortable with this superb solution.